(Francisco Kjolseth | The Salt Lake Tribune) Vincent Rocco Vargas a local entrepreneur/actor who's in the cast of the new FX series Mayans M.C. (which is sort of a continuation of Sons of Anarchy), hangs out at his business, Throwbacks Barber Company in Salt Lake City recently as he talks about the arc of his life from a military background to acting. (Francisco Kjolseth | The Salt Lake Tribune) Vincent Rocco Vargas a local entrepreneur/actor who's in the cast of the new FX series Mayans M.C. (which is sort of a continuation of Sons of Anarchy), hangs out at his business, Throwbacks Barber Company in Salt Lake City recently as he talks about the arc of his life from a military background to acting. (Francisco Kjolseth | The Salt Lake Tribune) Vincent Rocco Vargas a local entrepreneur/actor who's in the cast of the new FX series Mayans M.C. (which is sort of a continuation of Sons of Anarchy), hangs out at his business, Throwbacks Barber Company in Salt Lake City recently as he talks about the arc of his life from a military background to acting. 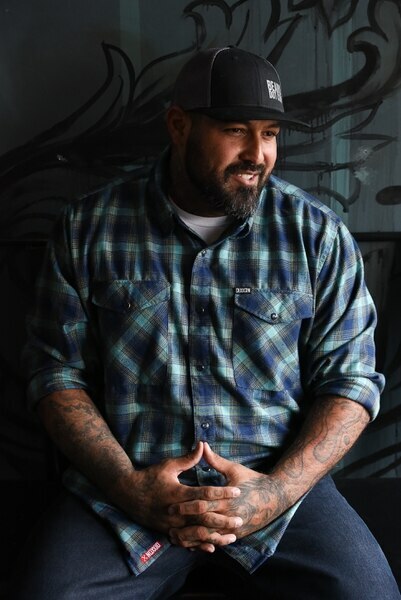 (Francisco Kjolseth | The Salt Lake Tribune) Vincent Rocco Vargas a local entrepreneur/actor who's in the cast of the new FX series Mayans M.C. (which is sort of a continuation of Sons of Anarchy), hangs out at his business, Throwbacks Barber Company in Salt Lake City recently. (Francisco Kjolseth | The Salt Lake Tribune) Leonidas Velasquez, left, snaps a selfie with Vincent Rocco Vargas a local entrepreneur/actor who's in the cast of the new FX series Mayans M.C. (which is sort of a continuation of Sons of Anarchy), hangs out at his business, Throwbacks Barber Company in Salt Lake City recently as he talks about the arc of his life from a military background to acting. 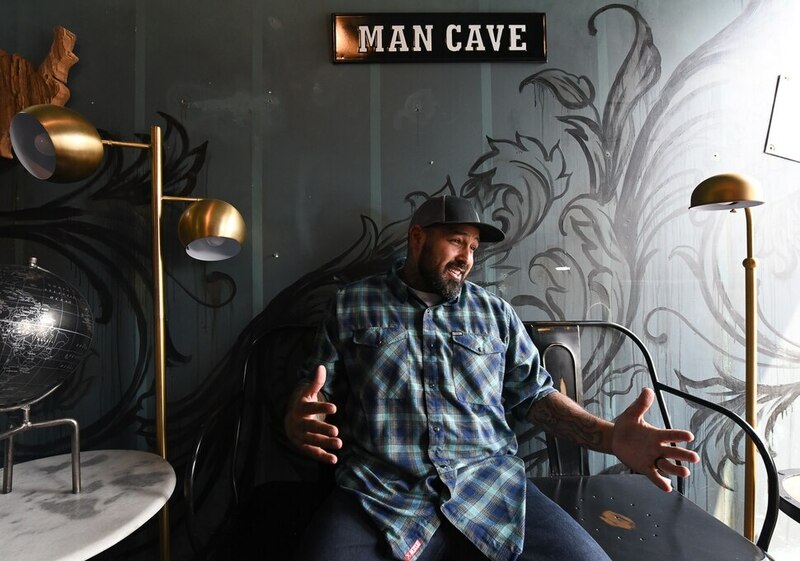 (Francisco Kjolseth | The Salt Lake Tribune) Vincent Rocco Vargas a local entrepreneur/actor who's in the cast of the new FX series Mayans M.C. (which is sort of a continuation of Sons of Anarchy), hangs out at his business, Throwbacks Barber Company in Salt Lake City recently as he talks about the arc of his life from a military background to acting. (Francisco Kjolseth | The Salt Lake Tribune) Vincent Rocco Vargas a local entrepreneur/actor who's in the cast of the new FX series Mayans M.C. (which is sort of a continuation of Sons of Anarchy), hangs out at his business, Throwbacks Barber Company in Salt Lake City recently as he talks about the arc of his life from a military background to acting. Oh, and he lives in Herriman and owns a barbershop in Salt Lake City. “I'm nothing special. I'm just a normal dude with high drive,” Vargas said with a laugh. He may believe that; others disagree. After his dreams of baseball stardom died because of an injury, Vargas joined the Army and was deployed three times to Iraq and Afghanistan with the 75th Ranger Regiment’s 2nd Battalion. After four years, he left to work special operations with the Arizona Department of Corrections and then the U.S. Border Patrol. And now he’s … an actor? The light will shine on him more brightly when “Mayans M.C.” premieres Tuesday on FX. He’s in the supporting cast of the series, which picks up about four years after the end of the “Sons of Anarchy” timeline. The new show is about another motorcycle gang — Mayans M.C. — and centers on Ezekial “EZ” Reyes (JD Pardo), who’s a prospect (a novice) with the gang, and who is harboring secret motives. 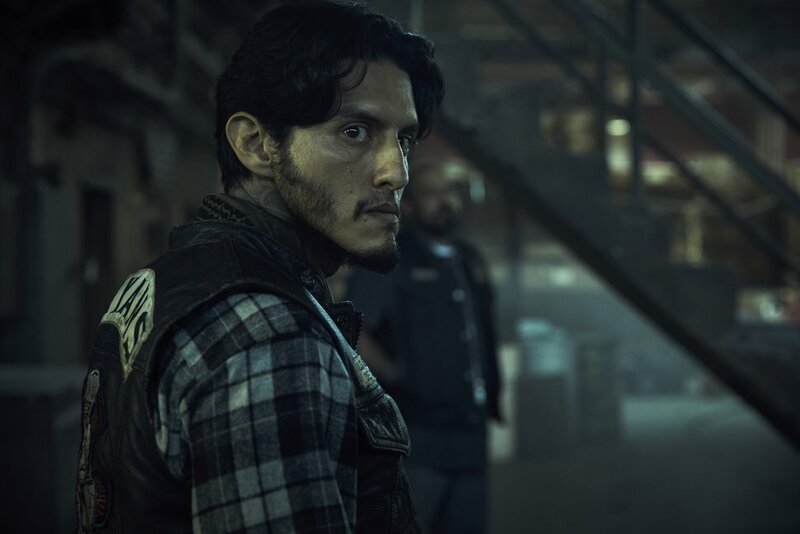 ON TV • “Mayans M.C.” premieres Tuesday on FX — 8 p.m. on DirecTV and Dish; 11 p.m. on Comcast. The cast includes Clayton Cardenas, Edward James Olmos, Sarah Bolger, Michael Irby, Carla Baratta, Antonio Jaramillo, Raoul Max Trujillo, Richard Cabral and Danny Pino. Expectations for the show are high, and the first two episodes (screened for critics) are very good. The supporting characters don't get a lot of screen time, but Vargas makes a good first impression. At first glance, he’s an intimidating guy. 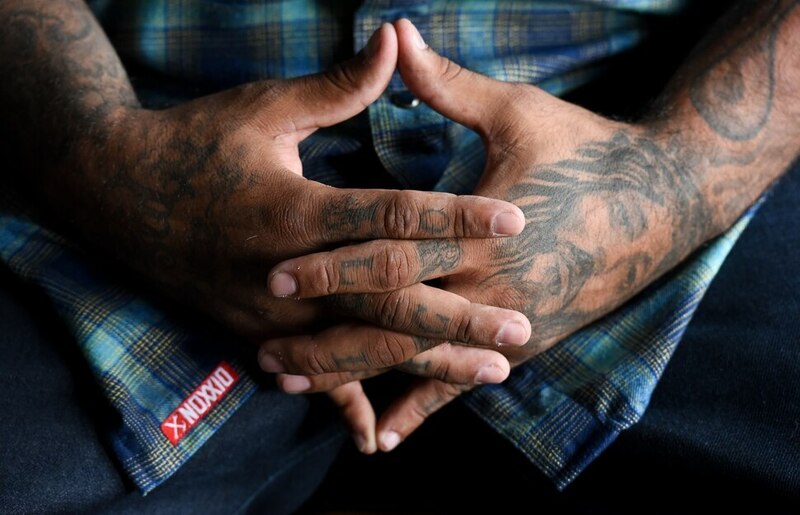 He’s 6 feet tall and 230 pounds, and he has tattoos. A lot of tattoos. But when you talk to him, you discover an affable, energetic, thoroughly likable guy whose enthusiasm is infectious. Vargas is the father of six who range in age from 5 to 15. The family left El Paso, Texas, where he was working for the Border Patrol. Vargas operates a number of social-media businesses, and beard.com turned out to be “the first big one.” And that, in turn, spawned the Throwbacks Barber Company at 930 S. Main in Salt Lake City, which feels like an old-school barbershop with a cool vibe. Vargas has been “cutting hair since I was a kid — learning how to do fades when I was 16 years old.” He cut hair for his fellow soldiers, for other member of the Border Patrol, for his friends and his kids. Not surprisingly, he has big plans for Throwbacks. “We’re hoping this thing does so well we can open them up around the United States,” he said. 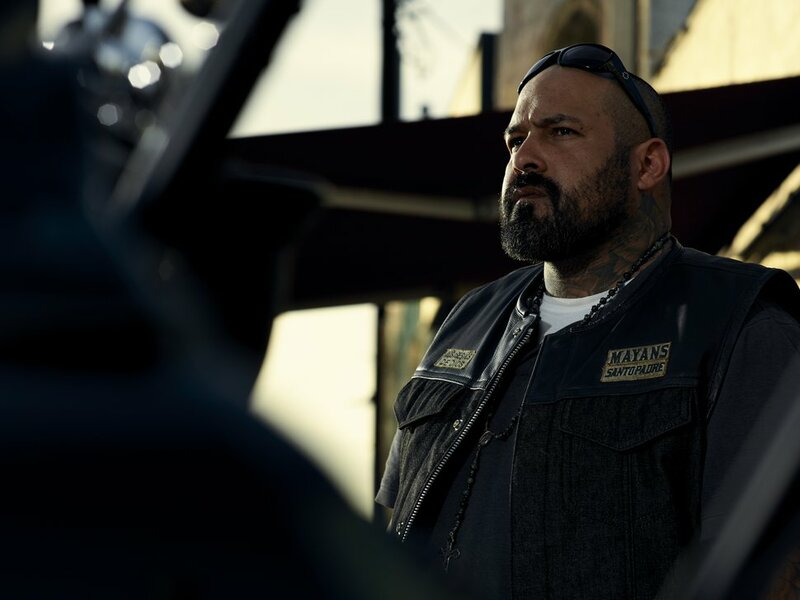 Making it to ‘Mayans M.C' • Vargas grew up in the San Fernando Valley, a short drive — depending on traffic — from the center of the entertainment industry. He took a stab at acting in his early 20s. But he’s dyslexic, and he struggled to read the script. “I got so embarrassed, I walked out of the audition. And I never thought of it again,” Vargas said — until after he’d joined the Border Patrol and started doing YouTube videos with a friend. He acted in the movie “Helen Keller vs. Nightwolves.” He produced and starred in “Range 15,” which became the first crowd-funded film to hit No. 1 on Amazon. “So my first big, starring role was in a movie I produced,” he said with a laugh. “I don't think anyone else would've given me a option. Vargas has big dreams and plenty of confidence, but he sounds a bit surprised that he was cast as Gilberto “Gilly” Vargas on the “Sons of Anarchy” spinoff. A friend landed him an audition, “and I read off paper. Did the best I could” for the casting director. By the time he flew back to El Paso, he had a message that creator/writer/producer Kurt Sutter wanted to see him. The second audition seemed to go well, but what clinched it happened afterward. As Vargas exited the building, his firefighter father excitedly pumped him for details and gave him a big hug while, unbeknownst to them, Sutter watched from a window. “He’s funny. He’s caring. He’s really about his boys,” Vargas said. “It’s the camaraderie that he gets into. Just like the military. It’s play hard and work hard. After he got out of the Army, he spent 2½ years as a prison guard in Arizona. Now he’s acting alongside Richard Cabral (“American Crime”), who grew up not far from him, was first incarcerated when he was 13, and at 20, served five years for shooting a man — and now the two are tight. “He always tells us stories from inside the prison — I tell them from the other side of the bars. And we laugh about things,” Vargas said. “We’ve built a close relationship off completely understanding each other’s past. “He’s said to me, ‘You could have easily been where I was.’ And, yeah, I could. I have friends that were. I was lucky enough to have a father to keep me out of that and push me in other directions. And it was just timing and luck — same as getting this part. The drill sergeant • For a week in November, about the time “Mayans” will be airing its final first-season episodes, he’s scheduled to resume his real-life role as a drill sergeant in the Army Reserve. His military rate helped him fly home to Utah every weekend during production on the 10 episodes of Season 1. Vargas speaks to veterans across the country, encouraging them to get whatever help they need to succeed in civilian life — including therapy, if necessary. And he encourages them to follow their dreams. “We stand in our own way by doubting ourselves and giving ourselves roadblocks when there's no need,” Vargas said. “Who would have ever thought this guy could've been in acting?